Theatrical activities are undertaken intermittently, primarily through H.A.M.S. — Hampshire Actors and Makers of Shows, coordinated by Dale Brady. Past productions have included Love Letters, Women’s Voices, Words of Love and Cookies, and Dr. Seuss. In April 2018 HCAC will be helping present a production of Richard III by Vintage Theatre for Hampshire High School students. 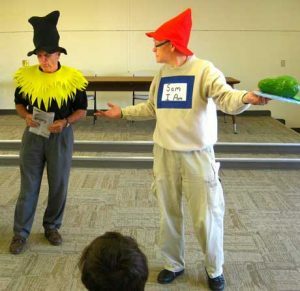 Charles Snead and Steve Johnson presented Green Eggs and Ham by Dr. Seuss. Arts Council Celebrates 25 Years of Service to the Community!